What did we order that met with such approval? Jicama rolls and beef noodle soup so spicy it made my head sweat. My entire head. Plus fried things: fritters of sweet potato and shrimp, wrapped up in greenery; a scallion pancake; an ugly-yummy fry-up of cooked egg and steamed rice flour called bahn bot chien. Lemongrass grilled pork and a shredded papaya salad with shrimp and mint. Creme caramel to close. 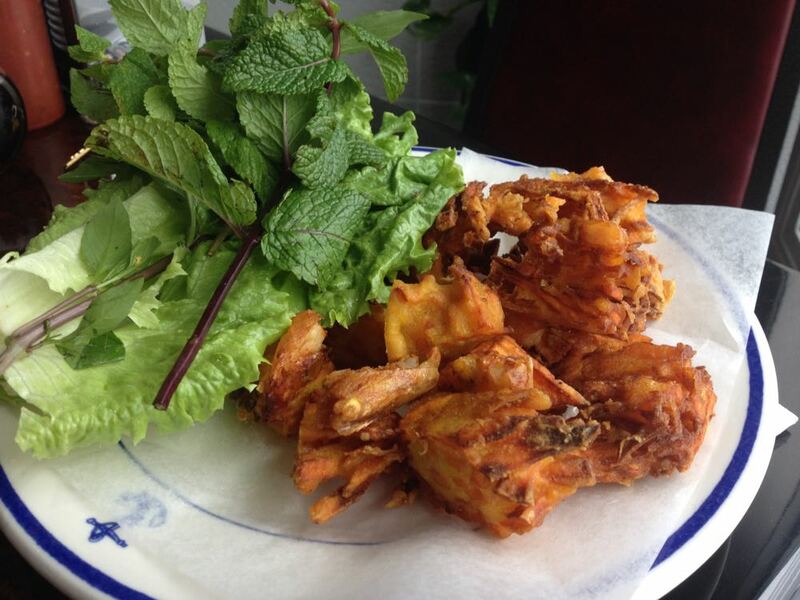 Once upon a time, the family restaurant Huong’s lived a block north. It moved to its bigger Booth Street digs in the summer of 2013. The room is banquet-generic looking and lighting is harsh, but the welcome at Huong’s is warm. Tea arrives. And seconds later, our first order, jicama rolls. I do like the more standard rice paper bundles of pork/shrimp/chicken/tofu plus vermicelli, greens and herbs, served usually with a hoisin-based peanut-sprinkled sauce. But if a Vietnamese restaurant offers the lesser-known jicama rolls, I head there. Made to order, Huong brings bold flavours to these packages, a mix of temperatures and textures. 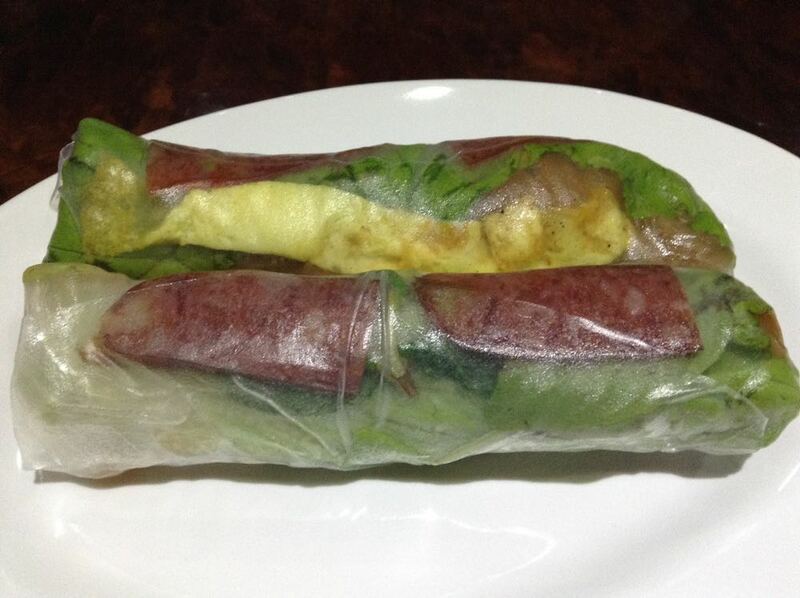 Warm, softened jicama, ribbons of omelette and diced Chinese sausage, dried shrimp, lettuce, basil, mint. They need no sauce. They are perfect as is. The crepe-omelette-pancake was studded with scallion, shrimp, carrot, pork, thickened with rice flour yellowed with turmeric and served with more of those bright greens. 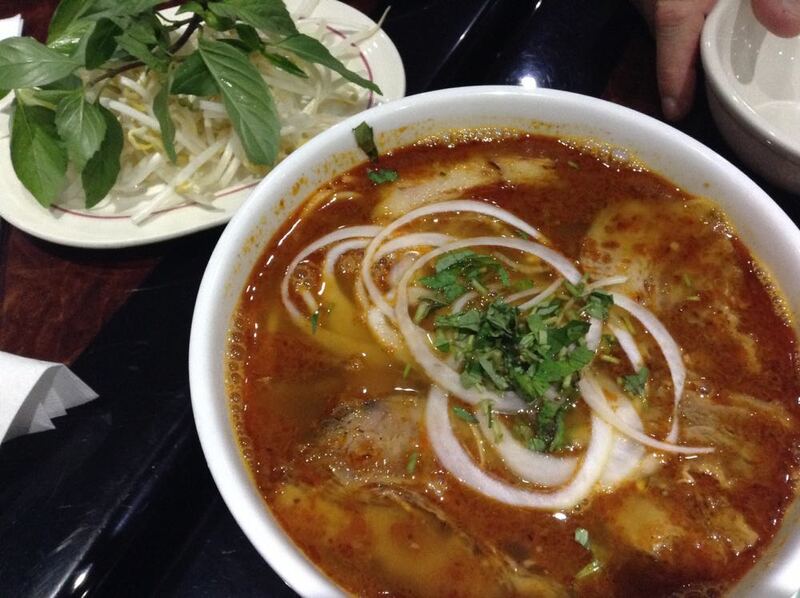 Hu Tieu Saté is a very spicy beef noodle soup with peanut. The broth tasted of chilies, star anise, ginger, garlic, fish sauce, peanuts, and came loaded with noodles, pork, carrot, tomato and rings of raw onion. You could further load it up bean sprouts and basil. Even another bird’s eye chile if you felt the need. Our first bite of the grilled pork ribs was successful. The meat tasted forcefully of lemongrass, and also sweetly of maple syrup. And then the medicinal flavour of artificial maple hit us and we liked it less. A sugariness marred the dressed papaya salad as well. So we focused on the sweet potato fritters, which were crunchy treats, and the stir fry of egg with steamed-fried logs of rice cake and crisp green onion. 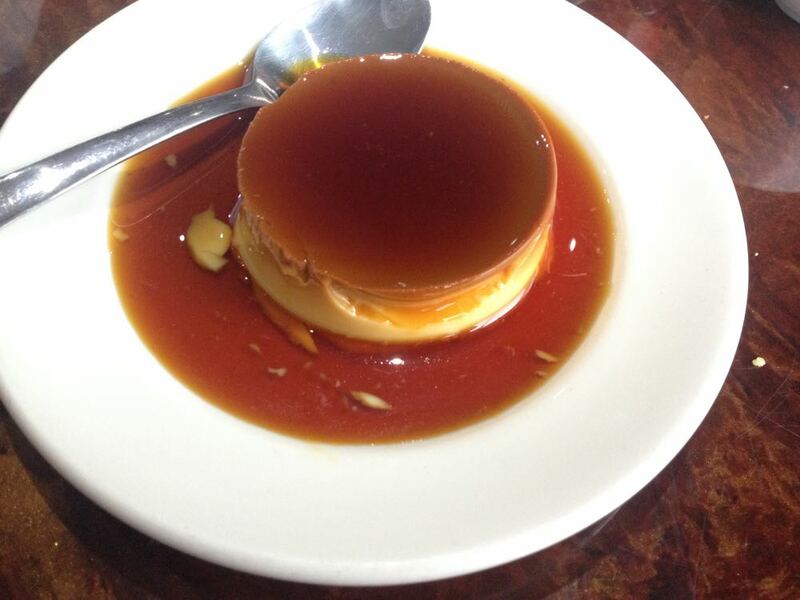 Creme caramel was perfectly passable. 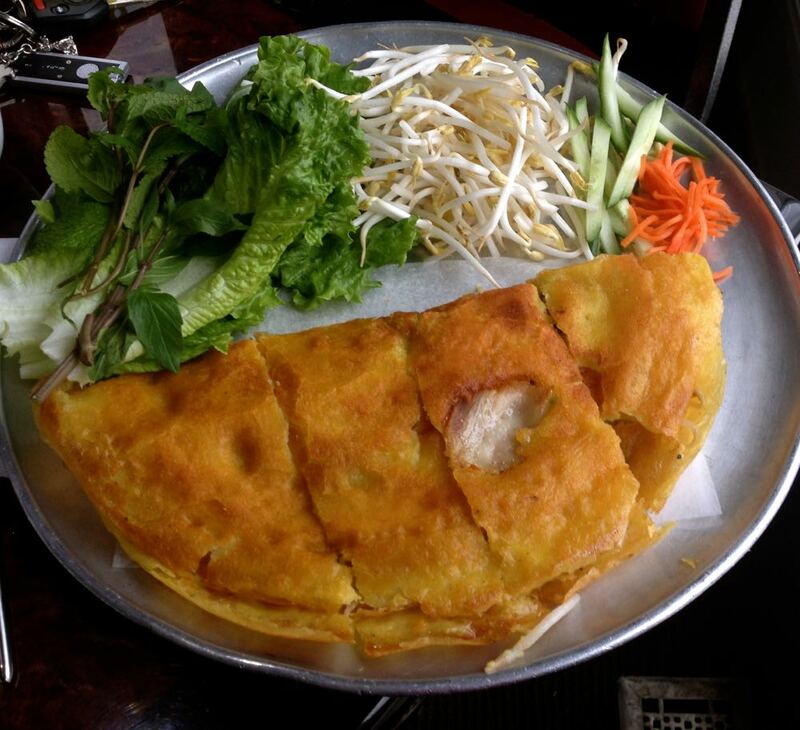 Vietnamese restaurants that still serve this hangover from French colonial times may be the only spots in town for it. Can’t remember the last time I saw one on a ‘French’ menu. I’d forgotten its comforts. Portions are large and prices are pretty low. So you can over-order happily.